The familiar laughter of a friend as you sit around the radiating glow of a beautiful fire are memories that linger long after the fire has been extinguished. Geneva Deck has safe alternatives, designed and manufactured by EcoSmart® Fire (the groundbreaking leader of the eco-friendly fireplace industry) to allow you to enjoy the warmth of the open flame while sitting on your deck. The perfect complement to your outdoor lifestyle. Geneva Deck Fire features fireplace’s, fire pit’s, fire tables and built-in models will enhance the ambiance of your outdoor environment. Design styles range from traditional to contemporary, are attractive and easy to use, and provide a safe and eco-friendly option to perfectly complement any outdoor setting. Inspired by the legacy of quality and craftsmanship, the design of the various fire pits allows the flame to burn, but without embers burning through your deck boards. 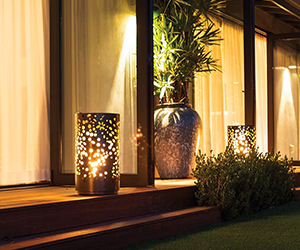 EcoSmart® Fire bio-ethanol burners are designed and manufactured to produce stable, robust flames compatible with the lifestyle of your outdoor environment.